The Early Learning Coalition of Southwest Florida recognizes professional development as an important component of quality early care and education for young children. We support one’s progress along their unique pathway to career goals with a variety of training opportunities. For more information on available trainings, view the ELC calendar and register online. 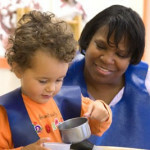 The state of Florida has adopted the Florida Core Competencies for Early Care and Education Practitioners. These competencies define a set of knowledge and skill standards that early care and education providers who work directly with children should know and be able to do in order to facilitate child growth and development and to partner effectively with families. They include expectations across a continuum of training, education and experience, ranging from the entry-level practitioner to practitioners with degrees, certifications and extensive experience. The identification of a core body of knowledge, defining the content areas and knowledge expectations for those working in the profession, is a crucial and foundational component to the development and implementation of a professional development system in Florida. These competencies will be tied to all of our trainings to help our providers make good decisions about which trainings they should attend.